Researchers at the University of Michigan Health System have found a new indicator that may predict which patients with a common type of throat cancer are most likely have the cancer spread to other parts of their bodies. Dr. Douglas Chepeha uses a scope outfitted with a small video camera to examine a patient’s progress. Patients with oropharyngeal squamous cell carcinoma who had “matted” lymph nodes – nodes that are connected together – had a 69 percent survival rate over three years, compared to 94 percent for patients without matted nodes, according to a study published online ahead of print publication in Head & Neck. The oropharynx is an area that includes the back of the tongue, soft palate, throat and tonsils. Notably, the findings indicate an increased risk independent of other established prognostic factors, such as the patient’s history of smoking or whether they have the Human papillomavirus (HPV), the study found. Smoking (tobacco and marijuana), heavy alcohol use and HPV infection have each been linked to the development of oropharyngeal squamous cell carcinoma. Matted nodes appear to be an especially strong indicator of increased risk among patients who are HPV-positive, even though HPV-positive patients had better overall outcomes than their HPV-negative peers. The patients with the best outcomes were HPV-positive non-smokers. The results affirm the value of having a team of doctors and researchers from different specialties – radiology, oncology, biostatistics and surgery – working together to find advances that can directly benefit patients, Chepeha says. “This was a collaborative effort and all of the authors made important contributions,” he adds. The study tracked 78 cancer patients who were part of a clinical trial evaluating two cancer drugs in combination with intensity-modulated radiation therapy. All the patients had stage III or IV squamous cell carcinoma of the oropharynx and had not had any previous treatment. Sixteen of the 78 patients had matted nodes. Head and neck cancer statistics: An estimated 52,140 people will be diagnosed with head and neck cancer this year, and an estimated 11,460 people will die from the disease, according to the American Cancer Society. Additional authors: K. Kelly Gallagher, M.D. ; Emily Light, M.S. ; Mohannad Ibrahim, M.D. ; Eric J. Chanowski; Jeffrey S. Moyer, M.D. ; Mark E. Prince, M.D. ; Gregory T. Wolf, M.D. ; Carol R. Bradford, M.D. ; Kitrina Cordell, D.D.S, M.S. ; Jonathan B. McHugh, M.D. ; Thomas Carey, Ph.D.; Francis P. Worden, M.D. 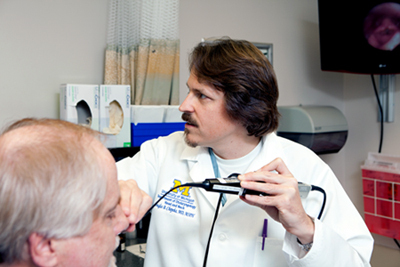 ; Avraham Eisbruch, M.D., all of U-M.
Funding: The research was supported by a Specialized Program of Research Excellence (SPORE) in Head and Neck Cancer grant from the National Cancer Institute. Citation: “Matted Nodes Are Associated With A Poor Prognosis In Oreopharyngeal Squamous Cell Carcinoma Independent of HPV and EGFR Status,” Head & Neck, Jan. 13, 2012.